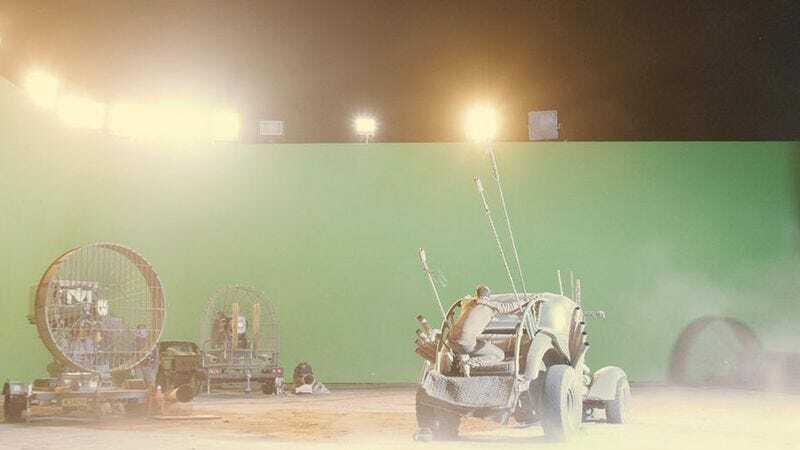 Mad Max: Fury Road has been rightly celebrated for both its insane practical effects and for Doof Warrior’s kickass flaming guitar, but one element that hasn’t been getting enough praise is the subtle work done by the film’s visual effects team. Thankfully, FXGuide is making sure those artists get their due in a new article that explores the more than 2,000 visual effects shots used in the film. For instance, there’s an extended sequence set during a rich blue desert night as Charlize Theron’s Imperator Furiosa and her ragtag crew travel through a muddy swamp. It turns out all of those scenes were filmed in bright sunlight in the Namibian desert and only transformed into evening shots in post-production. Jackson even pioneered a brand new technique of overexposing all the daytime shots so they would look better when converted to night. You shoot the layout and vehicles and gradually everything might get replaced except the camera and the positions of where things were. You may end up with nothing left of what was actually filmed, but the shot still inherits something real from the plate you shot originally. I still believe it’s worth doing for that reason. There’s plenty more detail in the article about everything from adding rock cliffs to the Citadel, filming dust with an iPhone, using previsualization technology to map out scenes in advance, digitally removing Charlize Theron’s arm, and literally replacing the sky in order to give scenes shot at various times some consistency and interest. The piece is clearly aimed at those with a working understanding of digital effects and filmmaking, but even novices will get a better sense of just how much detail goes into post-production. And for those who aren’t quite up to speed on their special effects vocabulary, this Wired behind-the-scenes video explains many of the same concepts in layman’s terms. Meanwhile those who want to learn about this stuff in even greater detail can check out FXGuide’s podcast with Jackson and Whipp as well as with cinematographer John Seale.